This sort of culture is rife with more than just creativity. It’s brimming with trust. There is no limit to time on the nap room. Employees can play a game of basketball in the middle of the day. And people are free to work in any of the creative spaces they please, rather than stay chained to a desk. All of it is accompanied with the understanding that Google hires the best, and that “the best” is what their employees will always give.It’s no secret. We all know you can’t have a Top Five Offices list without mentioning Google! 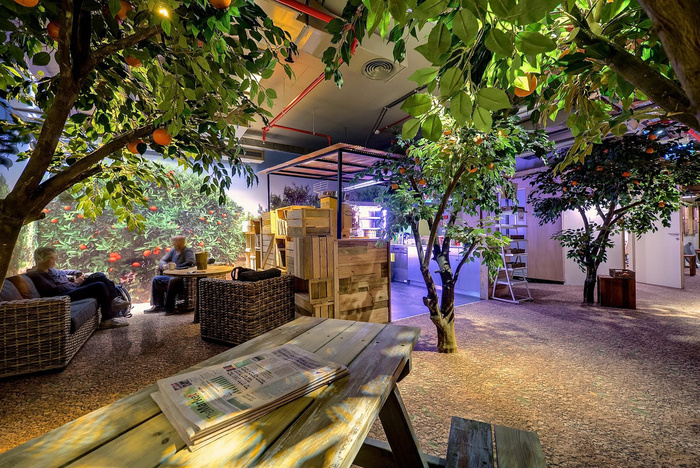 While the jury is still out on whether they started the trend of incredible workspaces, they have certainly set the bar. 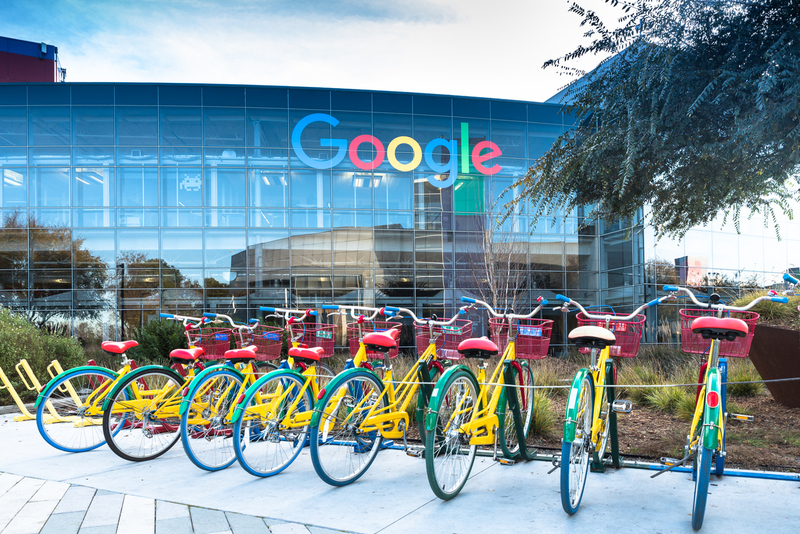 Google’s offices around the world boast some of the coolest, most inspiring environments an employee could ask for. From actual slides that take workers from floor to floor (sometimes ending up on a mock-beach), to rooms that come alive with grassy floors and mossy walls, Google has put more than a little thought and money into the space their employees spend so much time in. And that’s Google’s whole schtick. They know their employees spend so much time at work, they believe it should be a home away from home. That’s why they include some of the best perks a person could ask for, such as a completely free lunch cafe, gym, basketball courts, nap rooms (yes, please), movie theaters, and even a salon and spa. 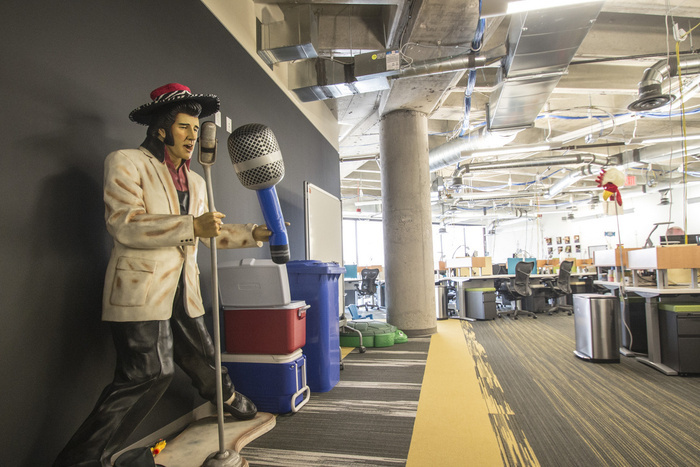 As is easily spotted in the open office environment, Zappos is huge on personal expression. Most of the employees desks look more like works of art than your standard sterile workspace. This expression and creativity are fostered so strongly, it’s no wonder they spill over from the culture into the work product Zappos is so proud of.A company that prides itself on being unconventional, Zappos has formulated its campus to scream just that. As you enter its open floor plan, desks are illuminated by hanging twinkle lights that are strewn across the ceiling. Hand painted murals of Biggie Smalls greet you by the front desk, and elevators are adorned with touchscreen games to keep you entertained (apparently it gets pretty competitive). As you make your way to the free lunch cafe, you stroll across a large courtyard adorned in funky metal sculptures and are serenaded by music that is always playing over the loudspeakers. You can have your lunch in the cafe which is replete with TVs, board games, and spaces to lounge around. 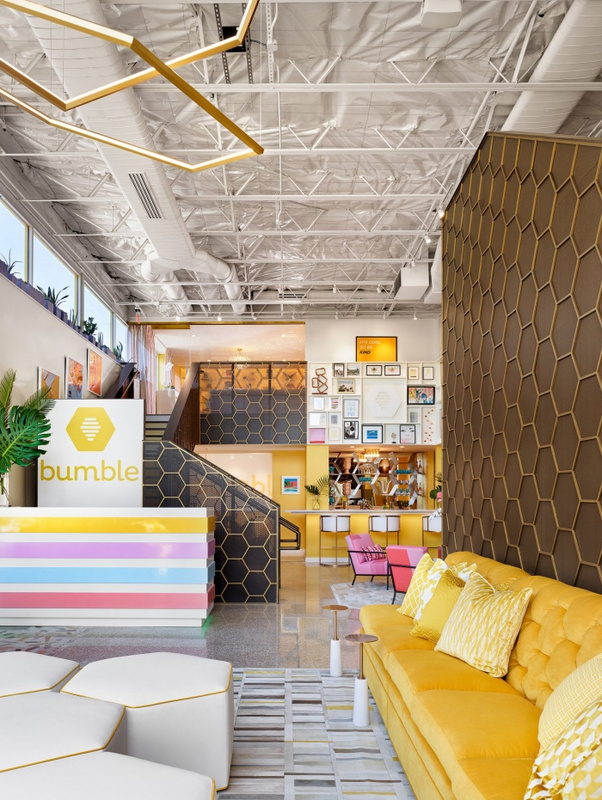 If happiness was a place, it would be the Bumble headquarters in Austin, Texas. With a workspace that feels more like a live-in spa dream home, it would be humanly impossible not to feel inspired in one’s work in the Bumble HQ. Natural light spills in from corner wrap windows, brightening the entire office from top to bottom. Known internally as The Hive, the office is adorned in the playful honeycomb pattern that is Bumble’s trademark, from light fixtures to tile installations. Upon entering, visitors are met with a candy-striped front desk and a waiting area worthy of Architectural Digest. As a platform originally built on empowerment and positivity, these values can be felt all over the office. Buzzing pink neon signs tell you to, “Bee Kind,” that “Brains Are the New Bee-auty,” and to “Make the First Move.” Crafted with women in mind, the Texas office has gone above and beyond to create a female-friendly environment, from free blowouts and manicures, to flexible schedules and even a mommy nursing bar. Now that’s what we call taking care of your people, people. If there’s any office where creativity will abound, it’s Pixar. Originally designed by Steve Jobs, it’s no wonder this place is brimming with brilliant detail. When first arriving, visitors are greeted by expansive courtyards that are laced with palm trees and and gardens. The main entrance for the campus is an atrium with enough space to land a jet, surrounded by large glass windows that fill the hanger with daylight. This is also where you will find the campus’ only bathrooms, courtesy of Steve Job’s belief that the foot traffic would lead to otherwise less-likely collaboration. As for amenities, employees can enjoy a game of basketball, tennis, soccer, or even go for a swim if they feel so inclined. When it comes their actual working environments, nothing could be more inspiring. Entering into many of the workspaces feels like stepping through your screen onto an animated movie. Some offices look more like tiny homes, complete with an address and basketball goal out front. Others are dimly lit, pod-like havens adorned in chandeliers, Chinese lanterns and velvet couches. 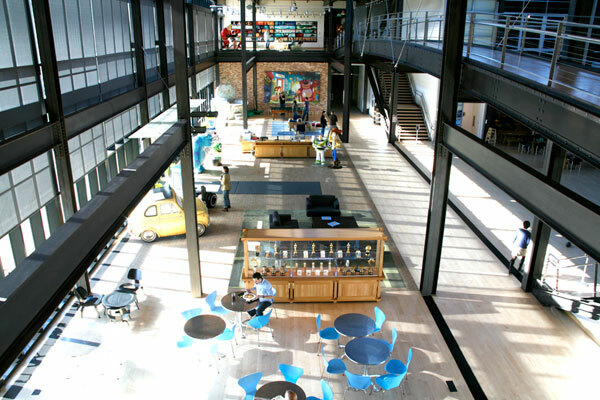 If there’s any doubting their spaces are influenced by the movies they create, take a quick visit to their multilevel meeting space built completely out of doors, compliments of Monsters, Inc. It’s no wonder at the genius that keeps pouring out of Pixar, as it is filled to the brim with it from the inside. Last but most certainly not least, we have the office of Pandora. When you think about what industries are drenched in cool, music sits right at the top. 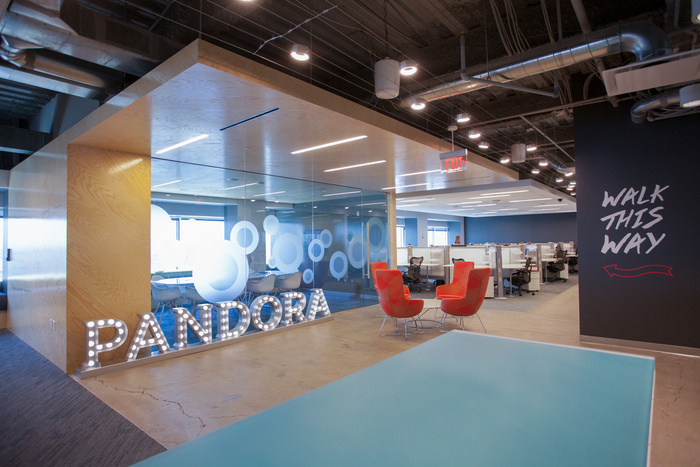 And Pandora doesn’t fail to take full advantage of its industry’s vibe. When you’re working in Pandora, you’re literally surrounded by cool. It’s plastered all over the walls, posted on screens and in the meeting rooms. Its walls are covered in custom icons to represent famous dance moves, while hallways look more like word searches, with music’s most used terms called out in red. Brainstorming rooms aren’t identified by numbers but by famous artists like Tupac or Salt-N-Peppa. And when you’re in need of a quick break, employees can make their way to the “Backstage Area,” which is converted into a music venue when musicians are in town and looking for a jam session. Again, we can’t all hire a Steve Jobs to come in and design our office, but we can garner inspiration from those that do. How can you pull some of these general concepts into your office to inspire your team? Maybe it’s about creating a space for them to brainstorm creatively. Maybe it’s instilling a culture of trust. Or maybe it’s as simple as a much needed paint job. What’s one thing you can do right now to make your space more creative? Let us know below!